You don’t have to go as far as Memphis for good barbeque. There are plenty of fine establishments in Arkansas that do a good job with smoked meats and great sauces, that make a drive that far out seem unnecessary. 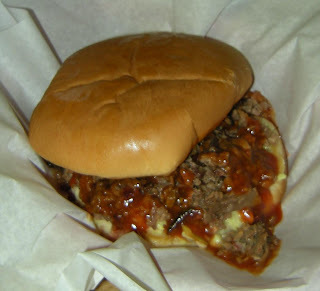 Over on Highway 1 in Forrest City, about a half mile south of Interstate 40, you’ll find Hickory House BBQ. From the outside, it’s not much to look at (what good barbeque restaurant is?) but on arrival it smells right -- and if it doesn’t smell right, you just don’t go in. My traveling companion and I stopped at Hickory House on our way east one Friday in February. The air was nippy, and a spicy lunch was called for. with big outdoor lantern lights and a couple of hutches with family pictures. Tables are “wooden” formica, booths are red, and the floor is a mishmash of broken red tiles sunk in cement. For a proper barbeque restaurant, this was positively swank. And large -- there’s seating for about 50 inside. One of the girls behind the counter told us to sit wherever we like. Another woman came out and asked us what we wanted to drink, and gave us the menus. The menus themselves are Spartan and to the point -- beef barbeque or pork barbeque sandwiches, combos with those sandwiches; beef, pork, chicken finger, or catfish dinners; and the special -- which includes pork, beef, pork ribs, BBQ beans, slaw, French fries, and Texas toast for $10.95. In fact, the only sides offered are BBQ beans, slaw, and French fries, but that’s not necessarily a bad thing. They’re all available in pickup packs to take home. 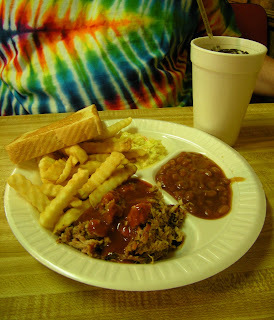 My traveling companion ordered the pork dinner (lunch $5.29, dinner $6.49) -- which came with a generous pile of pulled pork, doused in a healthy bit of sauce, served with a big slice of Texas toast, a pile of cole slaw, and the beans. My companion said the pork was still juicy, not the slightest bit dry. He told me he could still taste the smoke through the sauce. My companion rather enjoyed the cole slaw, but said the beans were somewhere near average. I ordered the jumbo beef sandwich combo ($6.89). The waitress had brought out forks for both of us, and for this I was glad -- it was a mighty big pile of beef! I had to indulge in a bit of the meat before I could pick up the massive bun. The beef without the sauce is moist and smoky, a little under spiced for my taste by itself, but a perfect match for the sauce. 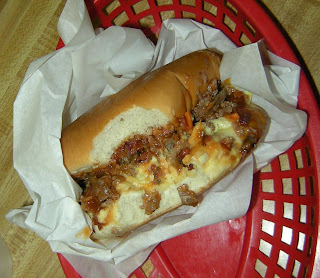 It's all perched on a pile of that sweet cole slaw on the bun... and somehow, someway, not a soggy mess. The fries were crinkle cut. I have a soft spot for crinkle cut fries. Our waitress brought out Heinz ketchup with our meals, and kept checking back with us. In fact -- we have to give big kudos to the staff. It was less than three minutes between our order and our food’s arrival. We do realize that barbeque like that is pretty much an assembly affair, but the attention was appreciated. Dinner for the two of us, including drinks, was less than $15. Hickory House also serves up chocolate, vanilla, and strawberry milkshakes -- but we were just way too stuffed to attempt one. Best of all -- for travelers, there’s a drive-thru, and it was busy the entire time we were there. You'll find Hickory House BBQ at 918 N. Washington in Forrest City -- that's Highway 1, for us out-of-towners. You can even call ahead to (870) 633-7751 if you want to order your meat to-go. It's been there 20 years or more, but for me, it was a real food find. Cole slaw on the bun. That is one thing that I never had in a BBQ sammich :) Guess it is an Arkansas thing. Though, I have had some pulled pork that benefited from the wetness of the slaw. Deep down, though, I am still a beef BBQ guy, down to my Texas roots.